Treat yourself or someone special to an exceptional dining experience or enjoy our traditional Afternoon Tea. 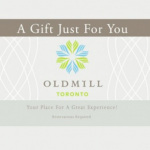 Old Mill Toronto gift cards are the perfect gift for any occasion, that everyone will appreciate receiving. You choose what size gift to send them – either $25, $50, $75 or $100 card or we will be happy to customize a card for you in any preselected dollar amount. Nothing could be more elegantly simple. Thank you, we look forward to preparing a “Gift Just For You” or your loved ones soon.